Football's world governing body, Fifa, has welcomed the approval of a bill by Brazil's lower house of parliament which will allow the sale of alcohol in stadiums during the 2014 World Cup. 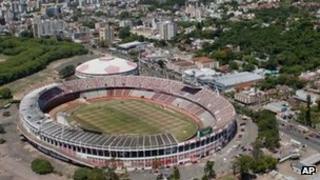 Alcohol sales in Brazil's stadiums are usually banned to help cut violence. Fifa's demand for a temporary exception to the ban has faced considerable opposition in the country. The American brewer, Budweiser, is a big sponsor of the World Cup, and had pushed for approval of the bill. In a statement, Fifa said it had taken note of the voting in the Brazilian Congress and that it was "pleased that finally the first step was made towards finalising this chapter". Brazil's Senate will now examine the wide-ranging bill for approval, before it can be signed off by President Dilma Rousseff. The legislation also gives Fifa exclusive image rights for the World Cup, and imposes financial penalties on any illegal reproduction. It stipulates that 1% of admission tickets are reserved for people with disabilities and that 300,000 tickets be sold at discounted prices. But it is the article on alcohol sales that has caused most controversy, with many opponents saying the government should not compromise on its commitment to a ban. Supporters say the arguments about alcohol sales should not jeopardise the passage of the bill as a whole. Renan Filho, a member of the Brazilian Democratic Movement Party which is allied to the government, said it was "a temporary change to ensure the best World Cup for Brazil".